Ruggedly beautiful, effortlessly chic, and sometimes shockingly expensive, Capri is one of Italy’s most fabulous resorts. A small island in the Bay of Naples, it’s been an upscale holiday destination since Emperor Tiberius made it his decadent summer playground in 27 AD. Capri has long been famed for its glamour and style, drawing the who’s who of Europe for yachting, high-end shopping, and unparalleled nightlife, and becoming the setting for many films and novels. It’s also the second residence of countless artists, actors, and writers from across the globe, lending the island an irresistibly hip, bohemian air. Although only about 7,000 people actually live on the island, visitors from the mainland hop over on ferries that leave regularly from Naples and Sorrento. Ferries dock at the Marina Grande, and passengers then head inland via funicular or bus. The island’s two main towns, Capri and Anacapri, can get crowded, but it’s always possible to break away from the bustle by heading away from the main resorts, where the islands jagged coast and rolling green interior provide the perfect place for strolling and exploring. Capri’s biggest attraction is, beyond doubt, the beautiful ‘Grotta Azzurra’ or Blue Grotto, a sapphire sea cave that for all its hype is still a majestic work of nature. Yet this isn’t the island’s only cave. Other grottos score the coastline; some of them were used by the Romans as sanctuaries or meeting places. Hiking along the coast and to these grottos is an excellent way to spend a cool morning. Other fascinating sights include the Villa Jovis, the most important of the twelve villas constructed by Emperor Tiberius; the Augustus Gardens in Capri; and the twisting and turning Via Krupp, a highway that’s a work of art in itself. Although not brought to fame until Emperor Tiberius built summer palaces here (and foreshadowed a tourism industry that still goes strong today), Capri’s history dates to the Bronze Age, when Capri may have been joined to the mainland. Throughout its history, Capri was often subject to pirate attacks and was always considered under the control of Naples. Local fish supplied by island fishermen (amazingly, there are still a few!) and in-season local constitute Capri’s most celebrated dishes. Most are simply prepared and garnished only with Olive Oil or fresh herbs, like the ubiquitous basil. Anything ending in ‘caprese’ is likely to have originated here. 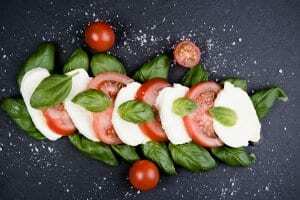 Ravioli Alla Caprese, a simple ravioli made with basil, tomatoes, and mozzarella, is excellent, as is Insalata Caprese, made with the same ingredients. Both are refreshing summer dishes that are usually served when tomatoes are at their peak and fresh basil is available. For dessert, try Torta Caprese, a chocolate and almond cake. Follow up the meal with Limoncello, a wonderful lemon liquor made locally. Stretching 60 meters into the Earth, Italy’s most famous cave is accessible only by boat. A sea cave with cobalt-blue waters due to sunlight that enters via an underwater opening, this is Capri’s most-visited site. Tiberius’ sprawling Villa Jovis, one of the best-preserved Roman villas in Italy, was built in the first century AD. Conceived as a fortress, it covers 7,000 square meters. The ruins allow you to imagine the splendor that must have once shown here. Claiming the best scenic view of the island, the Augustus Gardens (Giardini d’Augusto in Italian) is a lovely garden located beside the Carthusian Monastery of San Giacomo, at the end of the famed Via Krupp. This famously zig-zagging road, now closed to the public, was built (carved might be a better word – the road seems embedded in the rock) in 1902. You can walk along its hairpin curves from the Marina Grande to the Augustus Gardens.